The “olde black (might I add winter)” tote just wasn’t cutting it anymore. 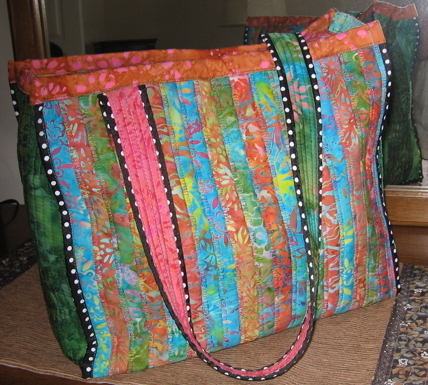 So a batik jelly roll set from Anthology inspired a colorful new spring tote. Making purses and totes is quite addictive! Just a dash of white on black polka dot ribbon made the colors pop – as if they weren’t already brilliant enough. Spring is here! (My laptop fits into it…. yea!) It’s big enough to be a good travel tote. This entry was posted in Copyright© 2009 All images and text in all categories are copyright of Mary A. Ritter (aka M'Unique) and may not be reproduced without express permission., Fiber Arts and tagged polk-a-dot, spring tote. Bookmark the permalink. Love your new tote. The colors are terrific. Finally figured out how to leave a comment on your blog. Up in NJ this week, so connections are pretty limited. Thanks! Glad you found the comment area. It’s in your color faves, right? I love that tote!! You are SO talented!